Eeekkk!!! I am so excited to share this project with you today. 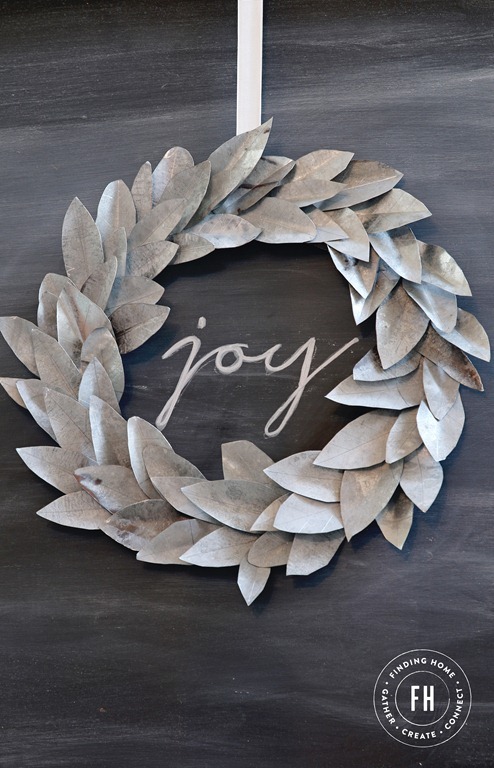 This Christmas DIY galvanized wreath has been living in my head for weeks – and now, here it is! I sat down Friday night at the kitchen counter and figure it out and got it done! So, here is the truth, it is not hard – anyone can do it. It is mildly tedious. I turned on the Hallmark channel and went until it was done. Now that it is finished and up on my chalkboard on my mantel, I realize it can be used well past Christmas. I love that it has a modern feel but is still so truly me. Seriously, I am not sure I have ever met anything in galvanized metal that I didn’t want to start a committed relationship with. – Eye protection and sturdy gloves – seriously, you really need these! – A really good pair of tin snips – I tried several sizes and shapes and the ones pictured worked best for this project. Okay, first you need a sheet of metal like pictured here. You can find them in the plumbing department of Home Depot and they are just under $10. It is shiny, which is nice, but not the look I was going for. You need to put the sheet in a large garbage bag and cover both sides in toilet bowl cleaner. It seems like one side seems to take better than the other (it gets rusty in some spots) and I am not sure how to know which is which – so just do them both. Leave it in the bag for several hours – checking on it to see if you are getting the effect you want. When it is “done”, the shine will be gone and it will have that yummy / pitted/ old look. Rinse and dry off the metal. As you can see – the back of the wreath is cut from the section that rusted on one side. Next, cut the sheet down into smaller pieces to make it easier to work with. Start on one end and draw our your leaf shape with chalk or a pencil. I did mine free-hand, but you could trace a template if you prefer. I actually stopped even drawing them out and just cut free hand. I prefer the varied shapes and sizes. Since I assume you will ask, there are 68 leaves on my wreath. I broke it up by cutting out a group and doing the next steps and then went back and cut out another group. It gave my hands a little bit of a break. Okay, this is where I put on my safety hat – you really really really need to wear protective gloves and eyewear through this whole project. Really. Okay, so now you need to file all of your edges so no one gets hurt on your wreath. This part can fully be done by hand with a metal file. However, if you have a Dremel tool, that is an option as well. I did some with the hand file and some with the Dremel tool with a grinding bit. Make sure to pay extra attention to the tips as they can be sharp if you don’t cut them rounded. Next, working on a cutting surface, use a cutting blade to score down the center of the leaf from tip to base. I went over it about 5 times. Don’t worry if you are off on some of the cuts, it doesn’t have it to be perfect. Then I went back in and cut lines out from the center to the outside edge. Repeat on both sides to create a leaf pattern. You are not cutting through, you are just making marks. The main goal with the scoring steps is to give it more of the look of a leaf and it helps with bending (the next step). Also, where you score, it becomes shinier and catches the light a little more (bling, bling!). Next, fold your leaf in half long ways. I just bent them all by hand (I am not wearing gloves because it is already smooth from filing). I switched up how much I bent each of them so that there would be more variety in the shape of the leaves. Then I folded the bottom edge flat. This gives you a flat surface to connect the leaf to the wreath base. Then, one by one I attached the leaves to the base with fast drying strong glue. I followed a pattern to a certain degree, fanning out three leaves to each section as I moved along. However, I sometimes varied the direction and number of leaves. When it was all finished, I shimmied a ribbon behind the leaves and looped it around to hang the wreath. Then, I left it overnight to make sure that all the leaves attached. In the morning, I gave it a good shake and a few fell off. I just re-glued them into place and let it dry an hour more.